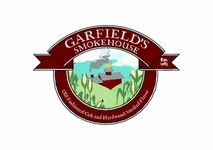 Garfields Smokehouse specializes in smoking the finest grades of meat in the authentic New England tradition. After meticulous selection, we smoke our meats with our own special blend of cobs and hardwood, smoking them slowly to assure you of the finest gourmet smoked hams and bacon. Boneless, fully-cooked, 11 to 15 lb. average. Your cost is calculated by multiplying actual weight of ham by $7.25/lb. Boneless, fully-cooked, pear-shaped, 6-8 lb average. 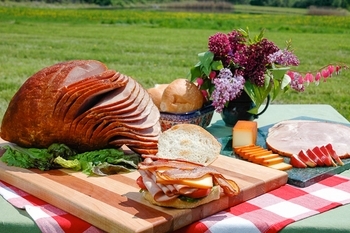 Your cost is calculated by multiplying actual weight of ham by $7.25/lb. 1 Lb. Thick Sliced vacuum-packed bacon. Just start baking and the family will all come running! Choose from either our slow smoked thinly sliced pepperoni (3 oz. ), or buy it in 4 oz. sticks and carve it up yourself. Either way you will enjoy the wonderful flavor. A delicious mild ground pork breakfast sausage with hints of sage and red pepper. Wonderful for breakfast or in spaghetti sauce or as a pizza topping. Copyright � 2011 Garfields Smokehouse All Rights Reserved.